DISCLAIMER: None of the following is intended to be investment advice. This is only meant to be a description of what has worked well for me so far, and my own opinions. Also, full disclosure, my links to Coinbase and Binance include referrals. It actually benefits you to use them because we will both get an extra $10 worth of BTC for free if you deposit at least $100 to Coinbase. Thanks in advance if you follow the links when you make your accounts — and even if you don’t, I hope this guide helps you out! This guide will teach you how to buy SALT from square one (i.e., all you have is fiat money, no cryptos). It will also work for most other cryptocurrencies, but as I’m interested in SALT right now, I am going to write a quick foreword about it and then we’ll get right into the meat of the guide. A Little About SALT — Why Buy? I’m going to open up a little differently this time: SALT is strange. It’s a cryptocurrency that is probably very different than what you’ve seen before. To me, this is a good thing — in a world full of coins that purport to be “the next Bitcoin” or “the next Ethereum,” it is always refreshing to see a coin trying to do something different and new. This is indeed one of the factors I often look for in a coin — if a coin has no unique features, you’d have a hard time getting me interested in it. SALT has been described as “lending platform” which is “designed for intuitive loan management.” What does this mean? Basically, users of the SALT platform will pay for a membership (with SALT, naturally) in order to participate in a lending and borrowing network which is powered by the blockchain. This is such a game changer that I don’t actually think it’s important to go into the other technicalities of the coin itself in this review — the idea of blockchain-based loans is groundbreaking enough that this should be the focus. Everyone knows about “leverage” in the real world — the idea of borrowing capital for investment purposes. Many property owners are quite “leveraged out,” for instance, i.e., they have borrowed a great deal of money against the value of their property. With clever use of smart contracts, SALT will bring the concept of leveraging to the crypto-world — users will be capable of leveraging various blockchain assets as collateral to secure loans. “Blockchain assets” means exactly what you think it does in this context — pretty much any blockchain-based coin such as Bitcoin. If you’re at all familiar with the financial world, you’ll immediately understand what a game changer this is. One of the biggest problems with cryptocurrency is its lack of liquidity. You might own 3,000 BTC (valued at about forty-two million dollars at the time of this writing), but the prospect of quickly using any substantial portion of it in the modern world is disappointingly dubious. SALT actually creates liquidity where there once was almost none — an early adopter’s giant stash of Bitcoin suddenly becomes a resource that can be leveraged against, like a person’s house or car might be used as collateral to secure a loan in the real world. SALT’s flexibility goes even further; it will even be possible to use SALT Membership tokens to repay your debt (including interest) within the SALT Lending Platform. This is a superb reason why SALT Memberships may fly up in price soon. Today, as I initially publish this writing (12/28/2017), we are at a turning point for SALT. This might just be the best possible time to buy in. According to an official blog post dated 12/27/2017, SALT loans are being rolled out this week. I can’t begin to tell you how huge I think this is. If one has an account on the Salt Lending Platform, they will soon be able to apply for loans backed by Bitcoin or Ethereum. So many coins promise much and deliver little, but SALT seems to be bringing some real functionality to bear. I could keep talking about this all day, but I’m trying to keep the length of this article down so I’ll end this intro with a brief word about the price of SALT by comparing it to Litecoin. LTC is ranked #5 on coinmarketcap with a market capitalization of $13,791,533,580. If SALT had LTC’s current market cap, it would be worth roughly $255 per SALT Membership. That’s almost 17 times the current price (less than $15). There is clearly room for a lot of growth here. For those of you on the Salt Lending Platform, you may have noticed that you can currently buy SALT Memberships directly from them for $27.50. This is considered the “retail price” and at first glance one would think this is a sort of “price maximum” for now — however, I’ve read in multiple places that the team will ensure that this retail price stays above whatever the exchange prices are, so I wouldn’t worry about that. Now, with the overview out of the way, I’m sure you’re as excited about this coin as I am — let’s figure out how to buy some SALT! Create and sign into a Coinbase account. I recommend Coinbase because they are the most straightforward exchange. Purchase some ETH. At the time of this writing, this currency transfers the fastest and cheapest out of anything Coinbase offers. Litecoin competes here, but will cause hiccups later in the process — more on that later. Create and sign in to a Binance account. I recommend Binance because they have been reliable and convenient for me and they offer many different lesser-known cryptocurrencies with trading pairs on both ETH and BTC. An added bonus is that you can withdraw up to 2 BTC/day worth of funds with no verification at all. Move your ETH to Binance. 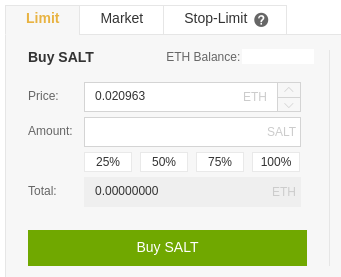 Once it has confirmed, you can now easily use the ETH/SALT trading pair to buy as much or as little SALT as you want. More on trading pairs later. Send your coins from Binance to a safe SALT wallet for long term storage if you intend to hold for awhile. This is not strictly necessary but it is considered a safer option than keeping ANY coin on ANY exchange long term. You might also choose to keep your tokens on the Salt Lending Platform itself, though this presents some of the same risks as keeping them on an exchange. This is arguably the most trusted exchange currently on the market. You can think of them as the PayPal of the cryptocurrency world, with all the good and bad connotations that come along with that. There are some countries where this is not the case! For example, in Canada, one would probably want to use QuadrigaCX instead. Unfortunately, that’s outside the scope of this guide, but I may do a country-by-country guide for acquiring coins later. All you have to do here is go to Coinbase’s website and create an account. Security is incredibly important here — remember, in cryptocurrencies you are your own bank and so it is absolutely crucial that you follow good security practices. This means your password should be strong — and it should be a password you aren’t using anywhere else (including other exchanges). Google has a pretty good guide with some tips on choosing strong passwords. Keeping security in mind, it would also behoove you to turn on two-factor authentication once your account is created. Once you are up and running there are a number of options when it comes to actually paying for coins via Coinbase. It is possible to link your bank account to Coinbase but actually transferring coins out of Coinbase will be impossible for a few days while the funds are clearing. This is obviously not ideal if you want to move quickly, as you would now have to wait several days to move your coins to an exchange where you can trade them for SALT (or any other coin). Instead, I would recommend you link a credit or debit card to Coinbase. This will allow you to purchase some amount of coins immediately, and then immediately send them off wherever you want — your wallet, another exchange, etc. At the time of this writing Coinbase offers three coins: Bitcoin (BTC), Ethereum (ETH), and Litecoin (LTC). In my opinion if you intend to buy lesser-known coins like SALT, ETH is the best choice to buy here. Why? Well, with regards to LTC, the reason is clear: other exchanges like Binance offer direct trading pairs for BTC and ETH, but not LTC or any other currency. What this means is that you could directly exchange your ETH for SALT, or your BTC for SALT, but you’d have to perform another step if you wanted to trade your LTC for SALT (and that means more fees!). Obviously we don’t want to waste even one cent if we can avoid it, so LTC is out. With regards to BTC, at the time of this writing there have been a lot of rumblings about high transaction fees, slow transaction times, etc. Exchanges often overpay these fees as well, and that means that you are again risking missing out on more money than you need to. ETH is therefore currently the best choice for our purposes by default — fastest transaction speed, lowest transaction cost. So, to review: create a Coinbase account, link your credit or debit card, and purchase ETH. I Bought ETH: What Now? Now is the time for you to make your Binance account. Follow the link and create an account using a strong password (this should be different than the one you used for Coinbase!). There are other places where you may be able to buy SALT (Changelly, Kraken, EtherDelta, HitBTC, KuCoin, etc.). I cannot directly recommend most of these exchanges as I don’t have much experience with them at this point — however, I can say that I have used HitBTC and KuCoin and they have worked well for me. This guide focuses on Binance because my experience there has been 100% positive — I have transferred coins in and out of their system many times with no problems. Once your account is made, you should set up two-factor authentication here via Google Authenticator. It’s safer, and you will need it to transfer coins out of Binance anyway. More on this later. Unlike the picture, there will be an “ETH Deposit Address” listed in the box at the bottom left. This is a very long series of letters and numbers, and is the fundamental basis of most if not all cryptocurrencies. An “address” is simply the destination for funds — think of it like the account and routing numbers at the bottom of your checks. For many cryptocurrencies such as Bitcoin it is possible to have multiple “receiving addresses” which point towards the same wallet. GDAX, or “The Global Digital Asset Exchange,” is the actual exchange which backs Coinbase. You can use it to save a lot of money on fees if you’re willing to spend a few extra minutes getting verified. 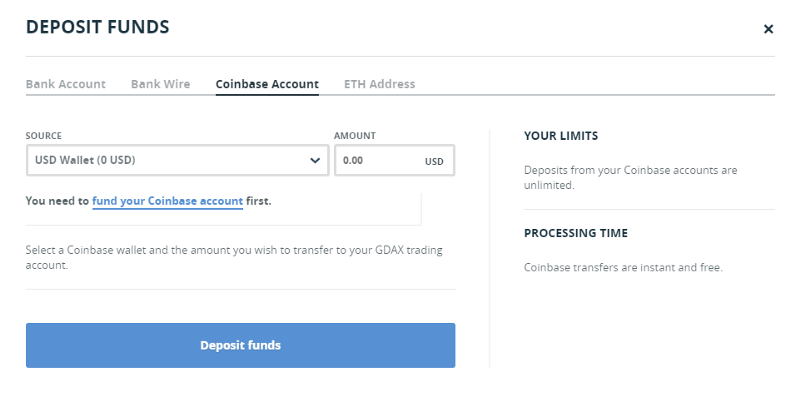 Follow this link and click “DEPOSIT.” Click “Coinbase Account” at the top and deposit all your ETH from Coinbase into GDAX. Once you’ve done this, you can click “WITHDRAW” in GDAX and send your funds from GDAX to Binance. Fees are significantly reduced with this method! I Sent ETH to Binance — Now What? Once you click Send, you will need to wait a little while. Without getting too technical about it, exchanges want to be as secure as possible. Thus, when you make a deposit, they wait for multiple “confirmations” from the network before allowing you access to your funds. You can view the progress in your Binance account by clicking Funds and then History. Do not be alarmed if nothing shows up at first! There are many reasons there might be a slight delay. In general you should see the transaction show up within a few minutes, with the current number of “confirmations” next to the number of required “confirmations” next to it. Be patient — your SALT is nearly in hand! Once you have the required number of confirmations, it’s time to trade your ETH to SALT. This is blessedly simple. In the front page of Binance, click “ETH Markets.” Search for “SALT/ETH” in this list, and click it. Now you are on the trading page. In the bottom left under “Buy SALT”, click “100%” below the “Amount” field. This indicates to Binance that you’d like to trade all of your ETH for a commensurate amount of SALT for no more than the price listed above. The price field is automatically listed based on the current market. If you like, you can change it to a different price, but like any market it’s not guaranteed that someone will buy at the price you’d like. Your order will remain open until it’s been fully filled or you cancel it. There are several options here such as Stop-Limit orders, etc., but this is outside the scope of this guide. In this case, you are simply placing a “Limit” order for some SALT. I Placed My Order! Am I Done? If you want to be done now, you can be — but there are more steps if you want to be security-conscious or make use of SALT’s unique borrowing/lending functionality. You may want to check under the “Orders” and “Order History” tabs that the order went through — if you placed a Limit order at the default price, it probably did. Once you have your SALT in your Binance account, you can see them under “Funds” → “Deposits Withdrawals.” You can click “Hide 0 Balances” at the top to clean up the screen of coins you don’t own, and you can see an estimate of the overall converted BTC and USD value of your account at the top right. For maximum security, I wouldn’t leave your coins in the exchange. I like and trust Binance, but ANY site can be hacked or experience downtime — even massively established trusted sites like PayPal. You want to have full control of your coins. How Do I Move My Coins to a Private Wallet? In Binance, go into the “Deposits & Withdrawals” tab, then click “Withdrawal” to the far right of the “SALT” row. By now it should be clear what you’re looking at — fields that let you input the address to send the coins to, and how many coins to send. For me, I intend to deposit my coins onto the Salt Lending Platform once deposits are re-enabled. For your convenience, there is a “Max” button to the right of the Amount field. Note that once you click “Submit” you will need to use your two-factor authentication via Google Authenticator, an Android app. I recommend you do not use your actual day-to-day phone for this purpose. These days you can get an inexpensive Android phone for around 30 dollars — this is an investment worth making for security purposes. You can keep the battery removed from the phone when you’re not using it, and connect it to a network only for cryptocurrency purposes. As a bonus, if you’d like, you can use this phone for the Coinomi wallet. It is possible to get SALT working in Coinomi right now and the process is fairly straightforward. In my opinion this is the preferred method, especially if you’re willing to buy an Android phone solely for cryptocurrency use. However, if you’d prefer to use a desktop wallet, I have written an easy-to-follow comprehensive guide which walks you through how to use MetaMask and MyEtherWallet to store any ERC-20 token, including SALT. One more thing about ERC-20 tokens: I understand it is possible to use a hardware wallet like the Ledger Nano S or Trezor to store them. I have not yet tried this myself, but I imagine it’s not that difficult — apparently all you do is plug in your hardware wallet and have it interface with MyEtherWallet in the place of MetaMask. If you’re confused by all this and want to know more, just check out my guide on the subject. Hardware wallets are probably the most secure option available, though they are also a somewhat pricier solution. Be advised that the information here only scratches the surface on SALT and cryptocurrencies in general. I recommend you read as much as possible. Cryptocurrencies are the future, and if you’re reading this guide you are already lightyears ahead of the curve.